If anything, many Samsung Galaxy Tab S3 fans already have an idea of what the premium tablet will be priced at after Best Buy recently listed the device on its website. Well, the same is happening with the official Samsung U.S. store, where the giant tech company has put up the Galaxy Tab S3 for preorders at the same price of $599.99. The store now joins giant American retailers Best Buy and Amazon in making the tablet available for pre-sales in the country ahead of the official release, which will be happening on March 24 or rather, next Friday. If you want to get the new Samsung Galaxy Tab S3 tablet, you can have it either in black or silver color variant. 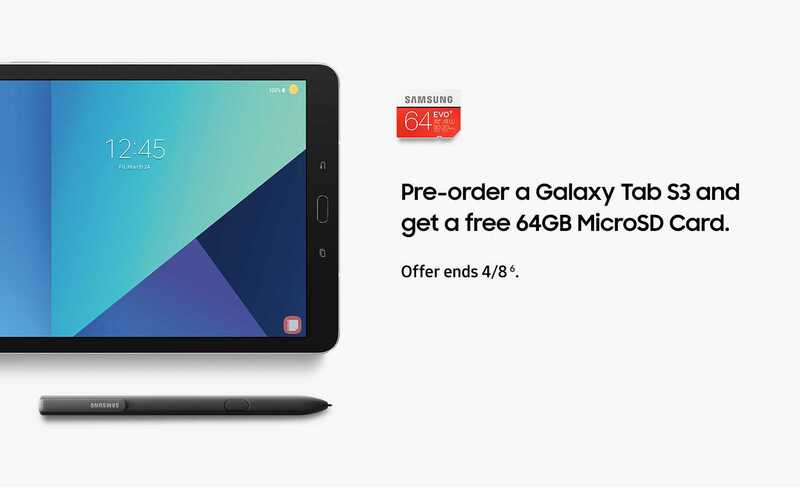 In addition, the South Korean tech company is throwing in an amazing deal to start with, where you can grab yourself a free 64GB microSD card by placing a pre-order right now. On the contrary, Samsung will be giving out a free Bookcover Keyboard to those who pre-order the Galaxy Tab S3 in Europe. In the U.S., this keyboard will be priced at $129.99 and it will also be available on the same day as the Tab S3. As noted earlier, the new Samsung Galaxy Tab S3 is a premium tablet. It comes with Android 7.0 Nougat out of the box and has a great 9.7-inch Super AMOLED screen with QXGA resolution. Under the hood, you get a Qualcomm Snapdragon 820 SoC paired with an Adreno 530 GPU for efficient gaming as well as 4GB RAM to keep everything smooth. There’s 32GB of storage and you get a free 64GB microSD card for expanding it. The back of the Galaxy Tab S3 has a top-class 13MP lens and it’s supported by a 5MP shooter on the front. To keep the tablet alive is a 6000mAh battery that is charged via a USB-C port and has support for fast charging technology. You also get a Samsung S Pen to improve your productivity with the device. You can also check out our best 3 features of Samsung Galaxy Tab S3.